The Irish Film & Television Academy (IFTA) is an all-Ireland organisation focused on film and television. It has about 1000 members and is based in Dublin with branches in London and Los Angeles. The IFTA now holds separate ceremonies for the IFTA Film & Drama Awards and IFTA Gala Television Awards; before 2015 they were one ceremony known as the Irish Film & Television Awards. IFTA also holds the John Ford Ireland Symposium each June and over 30 networking and learning events throughout the year. IFTA also established John Ford Ireland in 2011, in association with the estate of American director John Ford and the Department of Culture, Heritage and the Gaeltacht. ^ a b c "Terms & Conditions". Dublin: Irish Film & Television Academy. Retrieved 24 March 2018. ^ a b "About Us". Dublin: John Ford Ireland. Retrieved 25 March 2018. ^ a b "About the Academy". Dublin: Irish Film & Television Academy. 27 October 2017. Retrieved 24 March 2018. ^ "Past Awards". 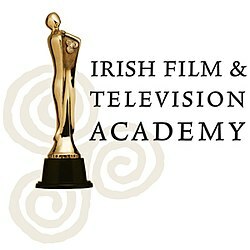 Dublin: Irish Film & Television Academy. Retrieved 24 March 2018. This page was last edited on 24 January 2019, at 20:19 (UTC).